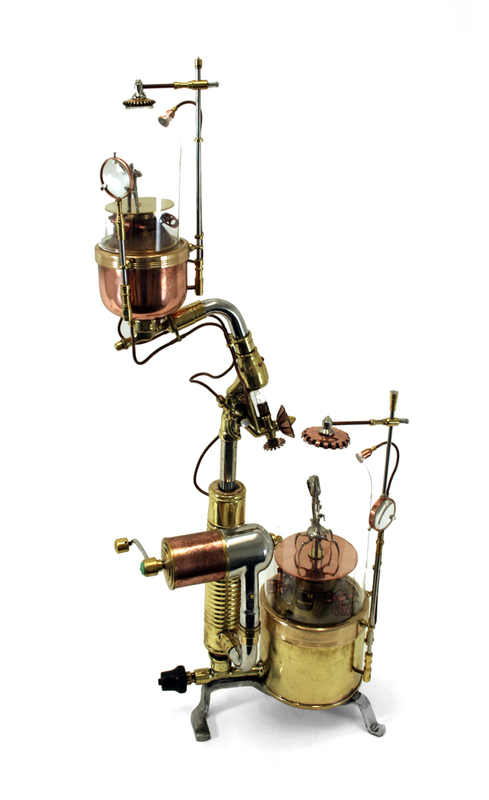 A table mounted version of Cornelius Dempsey’s apparatus housed in the Boggo Road collection. In Brisbane today, nothing is known of a Cornelius Dempsey who lived and died in obscurity last century. He did nothing of enough note to warrant a sentence in history. Nothing that is, in this universe. However, in one of the many alternate versions of Brisbane existing in quantum space, another Cornelius Dempsey worked tirelessly and perhaps successfully to escape from the four grey walls in which he had been sentenced for life. For a nefarious crime he had not committed. Cornelius was brilliant: his journals attest to his innovative and inquiring mind which conceived and created a tunnel, not under the prison wall and barbed wire fence to freedom, but through universes and dimensions to the site of what was once this Brisbane’s Boggo Road Jail. Little is known of what happened to that Cornelius Dempsey. Did he ever escape? Somehow his machines appeared in our universe, connecting to yet another Cornelius Dempsey in yet another universe. Was it only the machines that made the jump through time and space? Was he ever able to escape his own reality? We may never know, all that we have left are the apparatus and the secrets they contain.